When your business is relocating to a new place, the process requires a lot of planning and a relocation service that will help make the transition easier for both employees and business assets. 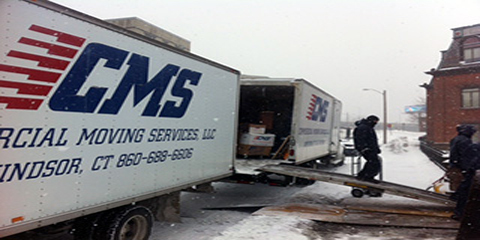 Choosing a commercial moving company is your best option for making sure the relocation runs smoothly and efficiently. Windsor, CT’s Commercial Moving Services is here to share why choosing commercial movers expedites your business’s big move. Full-Service Movers: When you choose commercial moving services, a team of professionals will ensure that your belongings are safe. The company provides all the services necessary, such as packing, loading and unloading, and even storage for certain items. They can also provide proper packing materials and cartons for every type of item, guaranteeing everything is moved safely and securely. Details Handled: A commercial moving company will know the necessary details for seamlessly relocating a business, no matter the distance. As long as you provide them with important information, such as the type of business you have and the number of employees, the movers will efficiently plan the move and get your business to its new location. Employee Assistance: If your move is a long distance and requires employees to relocate as well, commercial moving services can also assist with helping employees move and transition to their new city. They can assist in finding a home, along with other essentials like banks and schools nearby. Some companies will even help with vehicle registration and other necessary paperwork when moving to a new place. This helps families transition more easily in a very stressful time. For business relocating and moving services, Commercial Moving Services is the experienced moving company ready to help. Their full-service offerings can handle any size move and ensure your business transitions quickly and smoothly at affordable rates. Their packing and storage options provide customers peace of mind that their important items will arrive safely. Their reliable, friendly service has made them the Windsor area’s top choice in commercial moving services for over a decade. Visit their website or call them at (860) 688-6606 today. You can also keep up with the movers on Twitter.